Casa Flamenca was founded in 2010 as a 501(c)(3) nonprofit organization. As a small, home-based center for flamenco arts, Casa Flamenca strives to preserve the roots, artistry and soul of flamenco. Since its founding, Casa Flamenca has produced produced original, world-class artists in the flamenco arts. 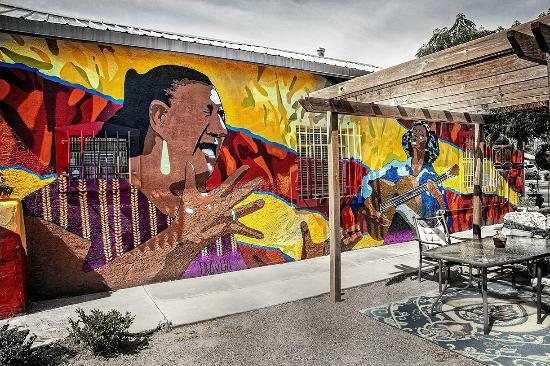 The mural at Casa Flamenca is painted by New Mexican muralist Jake Fragua. Flamenco dance and music classes are offered weekly throughout the year at Casa Flamenca. The program includes classes for the absolute beginner all the way through professional development. Child-specific classes train children in the fundamentals of flamenco rhythm, palmas (hand percussion) and dance techniques. Workshops and private lessons are offered throughout the year as well. Casa Flamenca focuses on preserving flamenco as a language. It is important to be able to understand the heritage and oral traditions of flamenco as a cultural art. Using a structured method and codified terminology, it becomes easier for the student to master the language of dynamic calls and signals which aid in the creation of both flamenco choreography and original music. Passing on this language of flamenco, Casa Flamenca helps establish a community that can continue educating others.